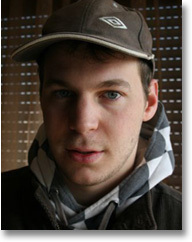 Vasil Filipov was born in 1989 in Skopje, Republic of Macedonia. He writes poetry, short stories and essays. His haiku have been published in several Macedonian literary magazines; and as a designer he has published several book covers, fliers and brochures for Poetiki (PEN International Diversity Project, Skopje). His languages include English and Italian, as well as the south Slavonic languages, Macedonian, Serbian and Bulgarian. He is currently studying Management in the Economics Faculty at the State University of St. Cyril and St Methodius, Skopje.